William van der Sloot has established a reputation as a leader in the development of young artists. 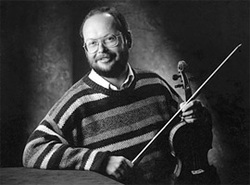 His students have won international acclaim, having won prizes in many major national and international competitions, including Grand Prizes at the Canadian National Festival, the Canadian Music Competition, the Alberta Provincial Music Festival, the Montreal Symphony Standard Live Competition, Klein Competition (San Francisco), and prizes at the ASTA Competition (USA), the Michael Hill International Violin Competition (New Zealand), Concertino Praha (Prague), the Menuhin International Violin Competition, the Montreal International Competition, and the Tchaikovsky Competition (Moscow). His students are heard on concert stages throughout Canada and abroad. They have performed often as guest soloists with many of Canada's major symphony orchestras. He is in demand as a guest artist and judge at music schools and international competitions in North America, China, and Europe. He will again be a faculty member at Mount Royal College's international Morningside Music Bridge program this summer, and is co-artistic director of the Valhalla Summer School of Music in Silverton, BC. Invitations for this season include the San Francisco Conservatory of Music, Victoria Conservatory, Southern Methodist University, Northwestern University, Carnegie Melon University, the Meadowmount Summer School of Music, the Central Conservatory (Beijing), the Chopin University (Warsaw), and Escuela Superior de Musica de Catalunya in Barcelona. William van der Sloot began his violin studies at the age of seven. His principal teachers include Mary Shorr, Dr. Lise B. Elson, and Gerardo Ribeiro. He also worked in extensive masterclass seminars with Max Rostal, Tibor Varga, Yehudi Menhuin, Joseph Gingold, and members of the Juilliard, Hungarian, and Alban Berg String Quartets. As a former violinist of the Villa Marteau Quintet (artist in residence at the Haus Marteau in Germany), he has toured extensively in Eastern and Western Europe and North America and has recorded for German, American, and Canadian National Radio. Before moving to Calgary to teach at Mount Royal, he was instrumental in the development of the Conservatory at Medicine Hat College and its program for gifted youth. Mr. van der Sloot is presently manager of the Academy for Gifted Youth, Choral Programs, and is the Distinguished Professor of Violin at Mount Royal University, Calgary.